The intense color of a good Cobaltoan Dolomite is unlike any other, unique in the mineral world. 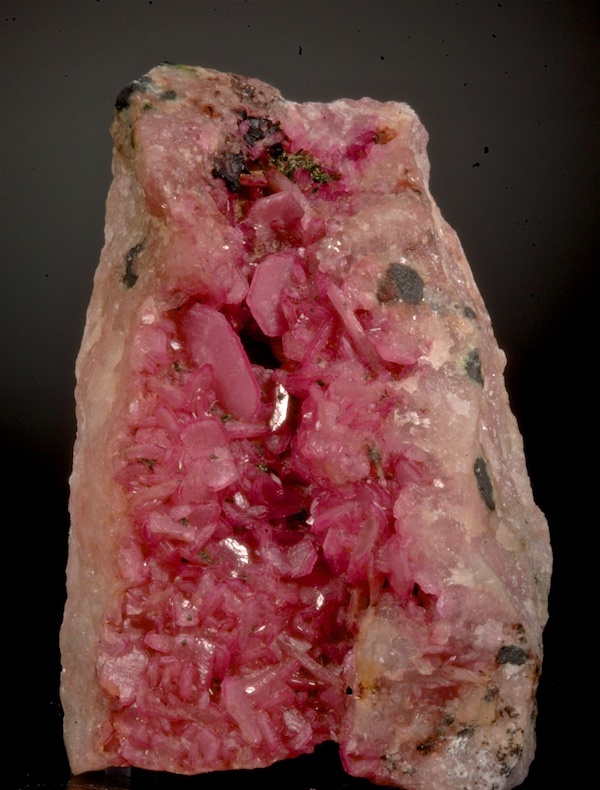 This specimen has top intense color, and the crystals are unusually well formed, some in tabular habit to 1.1 CM. In excellent condition as seen, this is an older piece collected years ago. Sawn on the back the front side is an open elongated vug that has protected the crystals well. Small dark green Malachite crystals are a nice color contrast. Super display esthetics and electric bright color jump out in any array of minerals. 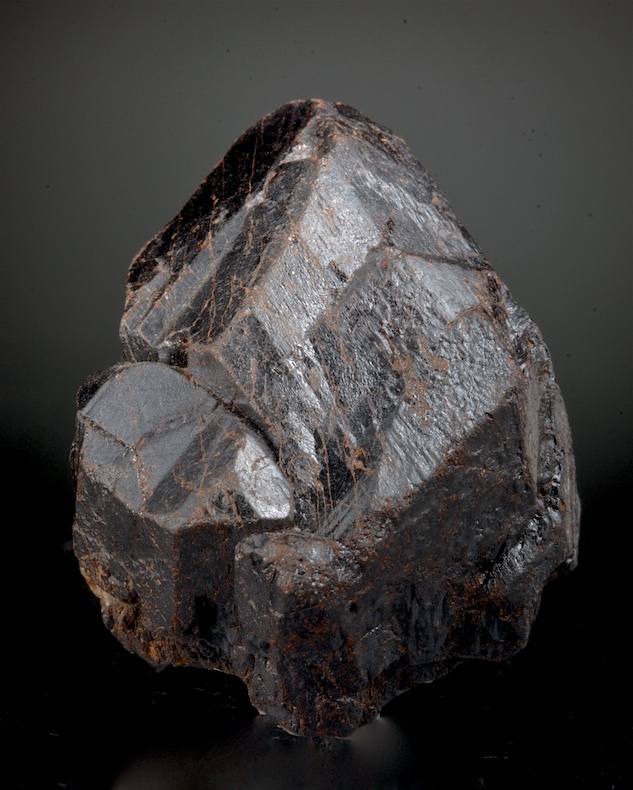 The form of these Hematite pseudos is simply incredible. This is a complete floater, no damage or contacts, sharp, metallic luster and very well detailed. One of the best mineral finds of the past several years the Payun Volcano mineralogy is fascinating and the morphology of the better crystals like this is exceptional. A killer, this is a superb Vesuvianite from the long past "Lago de Jaco" finds at what is now known as Sierra de las Cruces. Better in person, this is the best specimen we have seen available and is an important piece for several reasons. 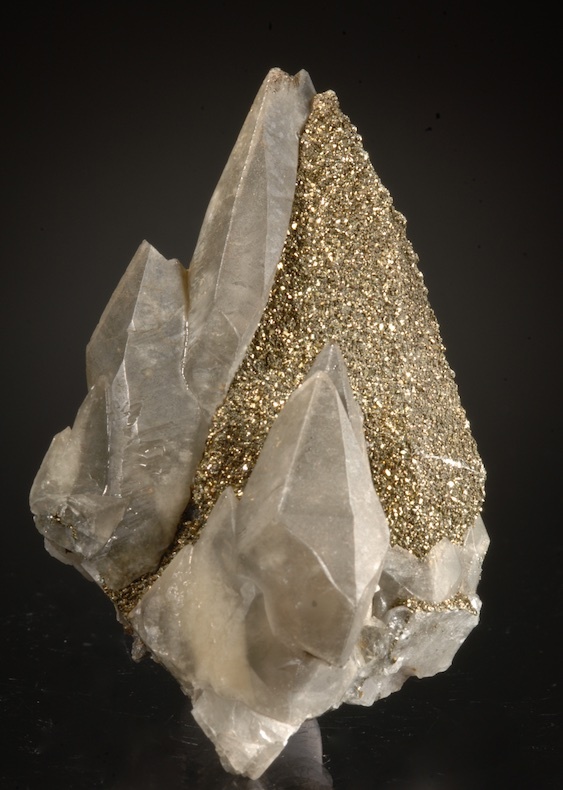 Large (5 CM) translucent and complete Vesuvianites in an esthetic cluster sprinkled with Grossular crystals. The Garnets are zoned and some have a distinct purple color which is very rare. These were found in the 1955-70 era and not of any quality since. Top shelf esthetics, unusually bright luster, complex face geometry, clear edge modifications and unusually well defined crystal architecture. Several terminations have a yellow-green zoning that highlights complex growth structures and are very eyecatching. 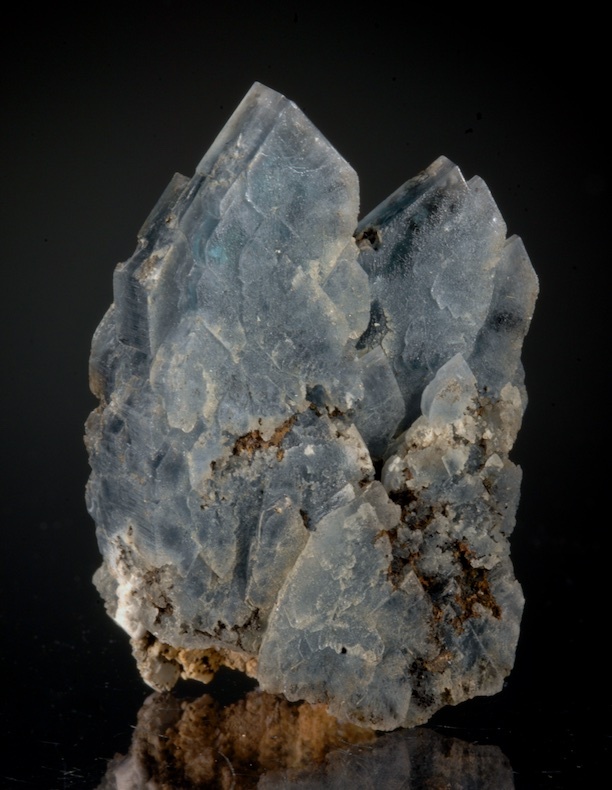 A deep blue chisel-tip Barite from the now classic Georgia (USA) locale at Cartersville. The deep "royal blue" color was the most desirable but very uncommon at this locale. This is a choice miniature example in fine condition, with good transparency, luster and very sharp terminations. Not often available anymore, a good Georgia Blue is a welcome addition for any suite of Barite and especially for a Southeastern USA collection. 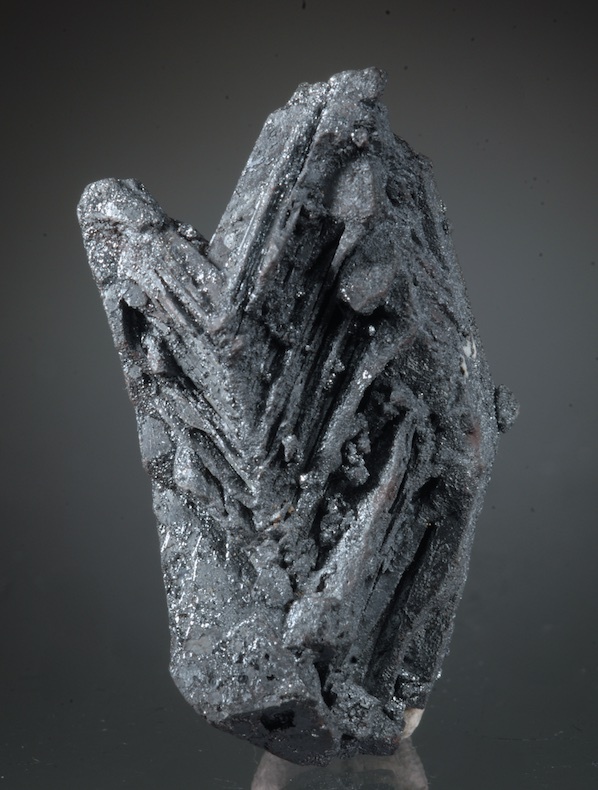 This is the termination section of a complex Rutile crystal that shows twinning. 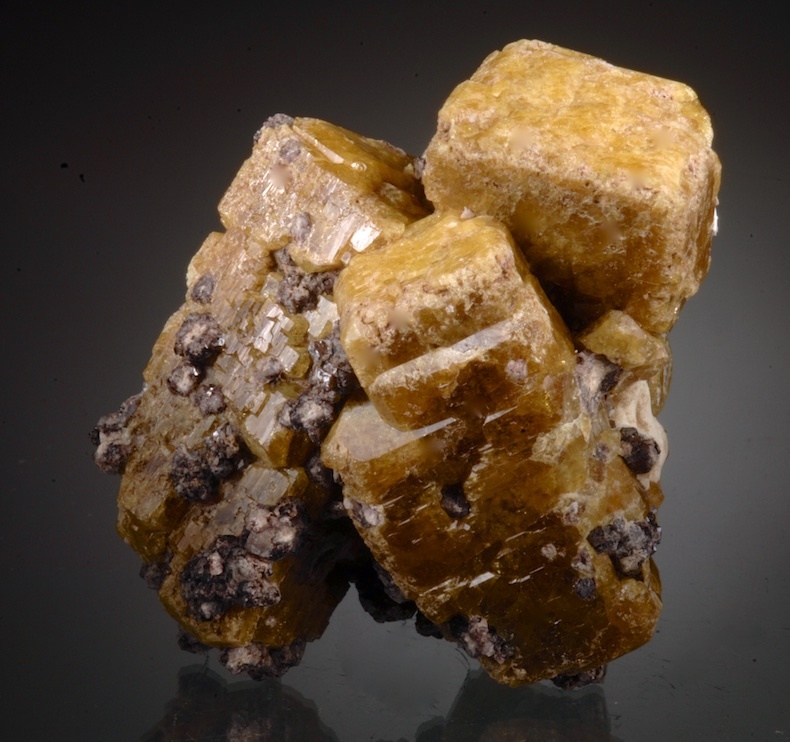 From the famed Graves Mountain locale, which is among the few localities worldwide that produced such large, blocky habit Rutile. Textbook form, undamaged and quite sharp for one of these, the color is a very dark red brown. No damage on any of the display sides, cleaved on the base (bottom) only. 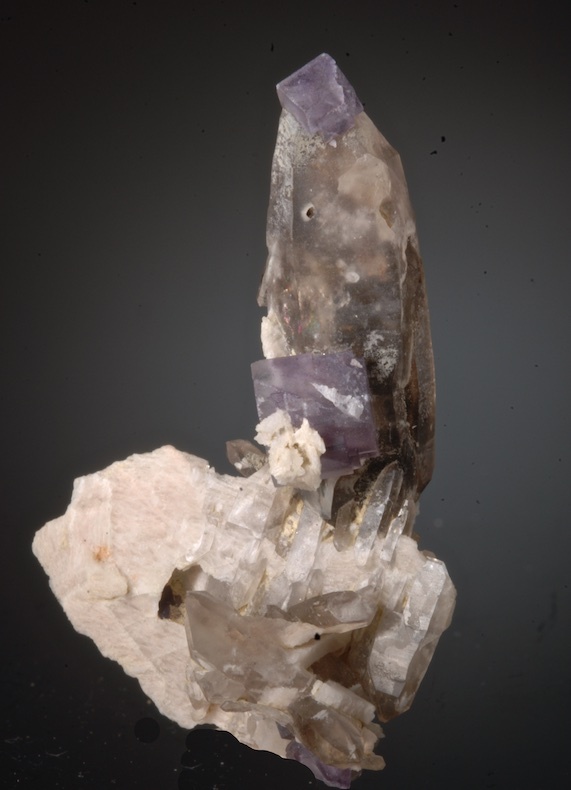 A multi-color phantom Fluorite nicely perched on a sculptural matrix covered with druzy Quartz crystals. 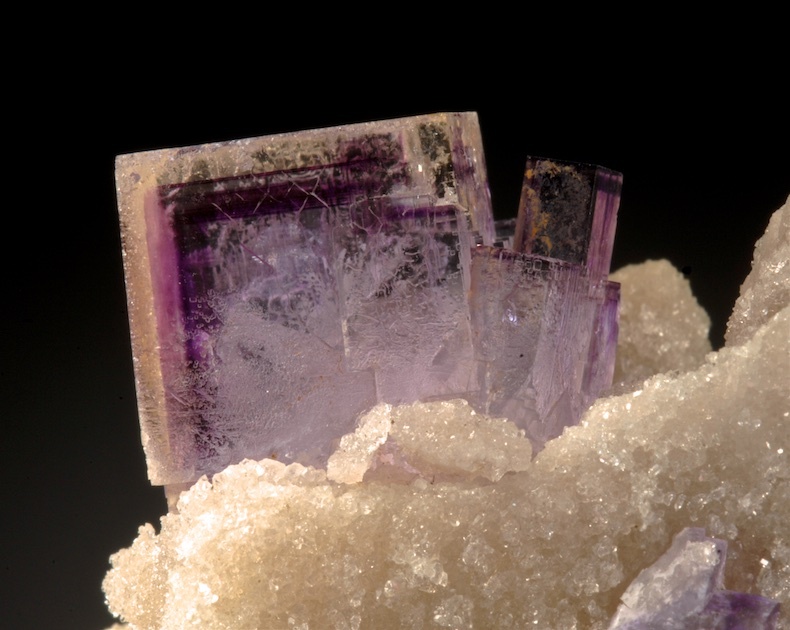 Excellent transparency and in fine condition, there are a few additional Fluorites on the specimen one of which is a slender, highly elongated cube. A classic European locale, the La Viesca Mine is famed for vibrant color varieties and general quality of its Fluorites. This one is a bit unusual but still has the look and style well known from this venerable locality.